If you’ve just invested in a grill, or simply want to step up your barbecue game, you’re probably looking at essential accessories. Thermometers, cleaning tools and cooking utensils are necessities, but have you remembered to get yourself some grilling gloves? When you’re working over high heat, grilling gloves are a must-have item. They allow you to handle grilling baskets and pots that hold your food. They keep your fingers from burning when you’re flipping burgers. They also help you manage the charcoal or grill grates without looking like you’re trying to perform a circus act. This article explains how grill gloves are different than oven mitts. We also discuss the difference in fit and heat resistance, and ultimately why we believe these are an essential item. Finally, we’ll review our recommendations for the best grilling gloves on the market so you can decide which ones are right for you. Why Do You Need Grilling Gloves? Do You Need Gloves Specifically Designed for BBQ? What Are Grilling Gloves Used For? Do the Best BBQ Gloves all Have the Same Heat Resistance? Does It Matter If Grilling Gloves Are Waterproof? You can’t get away with using the pot holder your grandmother knit you when you’re working at the grill. Even some oven mitts designed for use in a kitchen can ignite when they’re exposed to open flame or the heat of a grill. One of the benefits of grilling gloves over oven mitts is they have separated fingers. This allows you to be more agile when handling hot items or holding tools over a hot grill. Mitten-style pot holders are bulky and can be dangerous when you’re moving hot, heavy items. When you’re cooking in a kitchen, your hands and arms aren’t usually exposed to hot surfaces for long periods of time. A pot holder will suffice when pulling baking pans out of the oven or touching hot handles. When you’re grilling, your hands and arms are often working directly over fire. One wrong move could lead to serious burns. Plus, it can get uncomfortable holding your arms over such a hot surface. Grill gloves are designed to protect you from this type of heat. You’ll be able to move food around on your grill leisurely without having to withdraw your hands repeatedly. Some types of grill gloves even let you handle hot coals or grill grates without additional tools. Not necessarily. However, they must be designed to withstand a certain amount of heat. For example, some grilling gloves are made from thick leather. They’re made differently than those you wear to shovel snow. Don’t assume that your regular leather gloves can withstand heat just because they’re thick and durable. On the other hand, gloves that are made for working with heat in other ways can double up for use in grilling. Some people choose to use welding gloves for instance. The experts at Baker’s Gas and Welding Supplies explain that welding gloves come in a variety of materials. Thick suede being the most heat resistant. 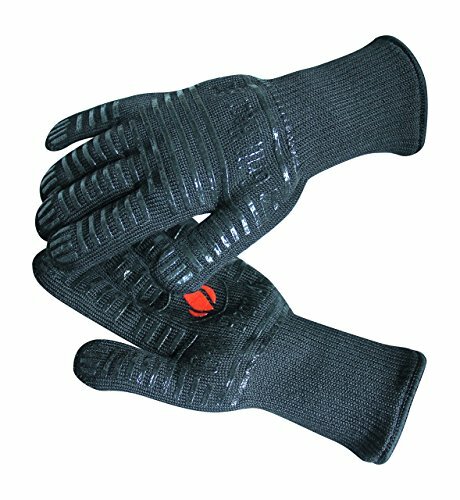 Welding gloves may be the best option if you want to touch hot coals or grates. They’re designed for coming into contact with hot metal and can handle this type of heat better than even most grilling gloves – And they are far cheaper too! Grasping hot handles on pots, pans and grill baskets. Turning the coals out of a chimney starter. Reaching over a large grate to flip burgers. Shifting grates to add charcoal or wood to a grill. Moving logs in a campfire. Grabbing hot food from the grill. Turning skewers without fiddling with tongs. Grilling gloves have different designs. Some are meant to protect your hands and arms from radiant heat. Others are designed to be used as pot holders. The manufacturer usually describes the degree to which they are are heat resistant. Char-broil explains that the temperature near the grates of a grill can get up to 550 degrees Fahrenheit while you’re cooking. The actual grates can get even hotter than that, depending on the type of grill or smoker you use. Not all grilling gloves are designed to come into contact with hot metal, charcoal or wood. Some should not be exposed to open flame. Even though you’re not planning to submerge your hands in a pot of boiling water, the water resistance of grilling gloves makes a difference. Wet surfaces conduct heat better than dry surfaces. If your gloves absorb moisture, they won’t provide the same level of heat resistance. In other words, if it’s raining, or your gloves absorb some oil or grease, some types of fabric won’t protect you anymore. If absorbent and they get wet or oily from handling foods, you could get burned, because heat transfers through moisture faster than through dry material. Knitted or woven gloves may not protect you from steam. Steam can get through the crevices in the weave and burn your skin. 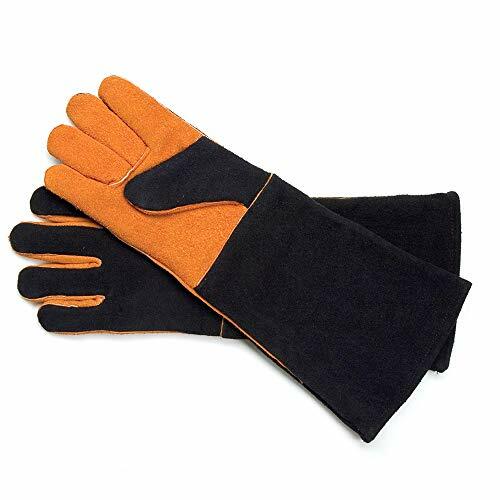 If you work around moist heat, you might need to look for gloves that are molded from a flexible material instead of knitted from a fabric-like material. The same consideration should be made if you’re working with hot oil. Oil can get through woven fabric in much the same way as steam. If it’s absorbed by the fabric, it can burn your skin inside the glove. However, hot oil can also melt certain molded materials. Check the manufacturer’s recommendations if you’ll be working with hot fats and oils. The reason why grilling gloves are typically made to be large is so that they can be flung off in an emergency. You have to sacrifice a little dexterity for safety. You can feel uncoordinated when your hand is sliding around inside a bulky glove, though. Gloves with thick linings can accommodate smaller hands better. Knitted gloves may have more elastic that results in a snug fit on smaller hands. Natural materials, like leather, tend to shape themselves to your hand structure better than molded synthetics. People with large hands may also have trouble finding the perfect fit. Some stretch to fit larger hands. However, a tight glove can be difficult to remove quickly. Also, consider the length of the wrist cuff when buying a grilling glove. If you’ll be holding your arms over a large grill or hot fire, you might want a glove that comes up to your elbow. Gloves with longer cuffs are also handy when you’re reaching into a ceramic egg, smoker or wood stove. A wide cuff will allow air to circulate while it protects your arm. A narrow or tight cuff can keep the glove from slipping off, especially if you have small hands and wrists. However, a snug cuff can also make your wrist and hand sweat over a hot grill. Grilling gloves may be exposed to soot from the grill or wood. They can also get greasy if you’re handling food or oil. You’ll probably have to deal with some degree of staining, especially if they’re made of fabric or leather. Some types of fabric gloves can be cleaned in the washing machine. If you are touching food with them, this may be preferable to you. Keeping gloves that come in contact with food clean is a priority. If they aren’t handling food, cleaning them thoroughly might not be high on your list of considerations. 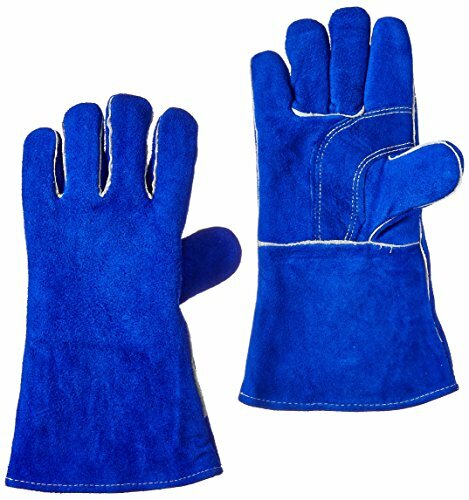 However, even a good-looking pair of suede gloves can get roughed up fairly quickly from touching charcoal or soot. If they can’t be completely cleaned, they may not be as attractive after a few uses. Light-colored gloves are more susceptible to staining. Even machine-washable ones may retain some noticeable stains if they’re white. If this bothers you, black, brown or gray colors will camouflage stains better. Watch this video to see how to use the hand-washing technique to clean your grilling gloves. There are literally hundreds of different bbq gloves on the market, so it can be hard to cut through the noise to find the perfect pair of insulated gloves for your needs. To help, we’ve put together a list of the best bbq gloves on the market, that will be sure to keep you happy…and burn free! I can’t stand the idea of honing my craft over a hot grill without being able to maneuver with grace. Ok, maybe my grilling technique isn’t that delicate, but I need to be able to move quickly and press the buttons on the thermometer as easily as I move the skewers around. This pair of bbq gloves fit me better than any others. They are thicker than my golf glove, that’s for sure. However, they still feel like regular gloves. You can move your fingers well, grasp even the smallest objects and maintain the dexterity that you have when you’re bare-handed. Made of soft cotton, the lining of the glove is comfortable against your skin. The more you use them, the better they seem to fit. These are knitted from a combination of Kevlar and Nomex. It feels like fabric but has superior heat resistance. The silicone strips that cross the gloves help provide a non-slip surface when you’re picking things up off the grill. They have the added benefit of helping you grip things like hard-to-open jar lids too. These are great for removing cast iron pans or Dutch ovens from hot ovens or grills. They can handle the heat from hot metal for a brief period of time. They’re great for moving things around the grill without fiddling with tongs. However, I wouldn’t use them to shift the coals around. They’re flame resistant but not fireproof. With a tight grip on a 650-degree baking stone, you’d feel the heat within less than 10 seconds. If these gloves become wet from handling food, they won’t maintain as much of their heat resistance. I wouldn’t recommend these for touching hot meat directly. The material might also leave fuzz on your food. You have to be careful when dealing with liquids. Interchangeable for right and left hands. Fit snugly and comfortably on large or small hands. Go on and off without sticking. Can buy extra-long cuffs for added arm protection. Fingers become fuzzy when handling rough surfaces. Steam can penetrate the gloves and burn you. The Grill Aid gloves are a useful tool if you’re dealing with regular grills, smokers or ovens. If you’re working with steam or open flame, you might need a more protective glove. When it comes to my BBQ accessories, I like to have flexibility. If I’m working with a smoker or hot oil, I need something more protective than fabric. Plus, it’s nice to keep a pair of gloves inside near the oven as well as outside by the grill. Having grilling gloves made out of different materials can be useful. The problem with many waterproof grilling gloves is that they’re too rigid. It’s hard to handle grilling tools when your hand is encased in what feels like thick plastic. This pair from Artisan Griller are made of neoprene on the outside. The neoprene outer layer is more flexible than silicone or rubber. It allows you to move and flex your fingers freely. Don’t you hate it when your hand sweats inside of your grilling gloves? The heat from the fire combined with the glove material can make you feel uncomfortable. The inside of this glove is made from soft, breathable cotton. The liner helps prevent your hand from sweating and sliding around inside of the glove. It also slides on and off easily. That’s important when you’re cooking several items on the grill. If there’s a flare-up or you realize the steak was supposed to come off a few minutes ago, you need quick accessibility. These gloves make that happen. Even if the outside of the gloves are greasy, they slide off of your hand easily. The textured palm gives them good grip on foods, pots and pans. Would I use these to move flaming charcoal or a cast-iron grill grate? The manufacturer claims that these can withstand 500 degrees before melting or burning. I wouldn’t use them to move wood or charcoal that’s on fire. I might try to move a grill grate only if I knew that I would be handling the hot item for a mere second. One of the downsides to this product is that they aren’t machine washable. However, you can get any grease and charcoal stains off of the exterior by washing them with water and dish soap. It would be difficult to wash the inside without creating a moisture problem inside the glove. Therefore, you should probably handle the gloves only with clean hands. Don’t allow oil or steam to penetrate through to your hands. Versatile for other uses, like using a deep fryer or canning. Won’t leave fuzz on your food. Protect your forearms even if you’re wearing a jacket or thick sleeves. Looser fit than fabric gloves. Don’t come in smaller sizes. The Artisan Griller gloves protect your hands from dry heat, oil and steam to a temperature of between 400 and 500 degrees Fahrenheit. Even though grilling isn’t a fashion show, it’s a bonus if I can look good while doing it. Steven Raichlen suede grilling gloves are a little more stylish than the other options. The two-toned suede is mostly black with brown on the palms and insides of the fingers. Suede feels more like the kind of gloves that you would wear for everyday use. It hugs your fingers and allows you to grasp things easily. You have better control when you’re working with your grill tools if you can feel them through the material. Of course, you don’t want to feel the heat. These provide heat resistance up to 475 degrees Fahrenheit. They are designed for working over a hot surface. The cuffs of these even extend almost to the elbow. They’re wide, so air can get in and circulate around your arms. That helps keep you cool while you’re working over a grill. They’re not recommended for prolonged contact with hot metal. Therefore, I’d be careful when using them to move grill grates and handle cast iron. I would not suggest using them to move flaming logs or coals. If you’re touching a hot surface, the heat starts to come through fairly quickly. Therefore, you don’t have much time before you have to drop the scorching item. One of my biggest gripes about these gloves is that they can’t be washed in a machine. Because leather is porous, it can easily absorb grease from foods. There’s not much you can do to remove oil other than wiping them with a damp cloth. For that reason, I would probably avoid handling food with these. It’s a good thing that it’s easy to grab my tongs and spatula with them. Extra-long cuffs protect the arms. Wide cuffs keep you cool and can be pulled on over thick clothing. Can’t go in washing machine or dryer. Need an extra pot holder when grabbing hot grates or handles. These gloves work well for protecting you against radiant heat and looking good while doing it, but you’ll need extra protection if you’re using them as oven mitts. I prefer feeling like I don’t have robot arms when I’m grilling. The Weber heat-resistant BBQ gloves feel like a pair that you’d wear in the winter. They’re a little thick, but you can move all of your fingers and maintain your dexterity. The snug wrist cuff keeps these from falling off, but you can easily tug them off if you need to. One drawback is that the tight cuff feels a little bulky if you’re already wearing a jacket or thick sweater. It also retains heat, which can give you a sweaty wrist. Still, the elastic snaps right over the sleeve of your clothing. The cuffs reach several inches up your forearms, giving you added protection there. They don’t extend all the way to your elbows, though. These are so pliable that they’ll even stuff into your pocket in a pinch. This is an added benefit when you’re timing hot foods and don’t want to deal with finding a place to set the gloves down. The palm side of the gloves contains a silicone pattern for added grip. This can help you hold onto slick handles or metal grill utensils. Because the pattern is only on one side, you can’t just pick up whichever glove is available and slip it onto either hand. Looking for the correct glove can delay your grilling by a few seconds. If these become even a little damp, they won’t protect your hands as well from the heat. That makes them better for use around dry heat. Moving a full pot of hot soup might pose a burn risk if the liquid splashes onto the glove. If you run into an emergency situation like this, you can pull the stretch gloves off easily as long as they don’t snag on your watch. Flexible gloves provide for natural dexterity. Fit well on small or large hands. Compact size makes them easy to keep near you or store. Can’t hold hot objects very long. Silicone is only on the palm side, so the left and right glove aren’t interchangeable. Can get snagged on jewelry while you’re putting them on and taking them off. The Weber grilling gloves feel like something you might wear on a regular basis. They’re comfortable for grilling, but they can’t handle too much heat. I like to have my gloves accessible. I always keep a pair with my camping gear, and it’s great to have a backup in case my favorite pair gets wet or ruined. 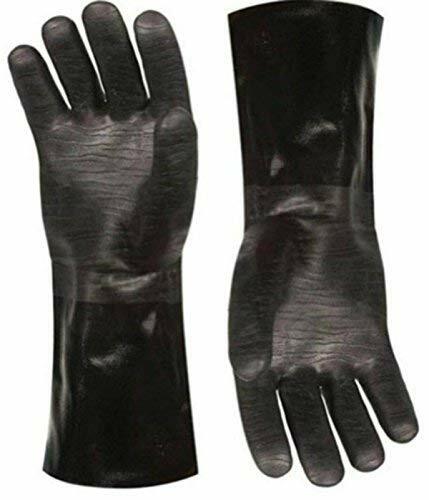 These lined leather welding gloves are inexpensive and designed to handle high heat. If it’s important to be able to touch hot metal directly, you might find these especially valuable. They’re made to handle molten metal. This means they will protect your hands while you lift a cast-iron grate off the grill. They also double as pot holders for moving pans and grill baskets around. Even though these are so affordable, it’s nice to know that they’re durable. They are reinforced in the areas that experience the most friction, so they’re not likely to pop a hole anytime soon. These might be the only gloves that I would use to touch burning logs. You can rearrange wood on a campfire or in a stove without risking burns. However, leather is still a natural material, and it can catch fire. I would suggest being extremely careful when exposing these to open flame. The leather will absorb liquids and grease from foods. However, you can toss the gloves in the washing machine after each use. This is another area where the price is attractive. If you find that the heat resistance is reduced over years of washing and drying, it won’t hurt your wallet too much to buy a new pair. Even if they’re a little big, they’re flexible and comfortable for most hand sizes. Can double as work or gardening gloves. Short cuff doesn’t protect arm up to the elbow. Leather can absorb grease from foods. These budget-friendly welding gloves may be the pair that I trust the most for handling hot logs and grill grates. If you want to spend your time at the grill focusing on cooking instead of avoiding burns, you’ll need decent grilling gloves. Finding the balance between fit, comfort, flexibility and heat resistance is important. We all have different preferences. I prefer the Grill Heat Aid gloves for general grilling. They’re comfortable and easy to take on and off, and the cuff is long enough to protect my wrist without limiting my range of movement. My dexterity is just as good with these on as with them off, so I’m happy to recommend these as the best BBQ gloves in the list. However, when I’m working with water and oil, I like the added safety of the molded Artisan Griller gloves. They don’t let steam reach my hands, and I don’t have to worry about splashing liquids. Because I like to feel abundant, it doesn’t hurt to have a few extra pairs of leather welding gloves floating around too. 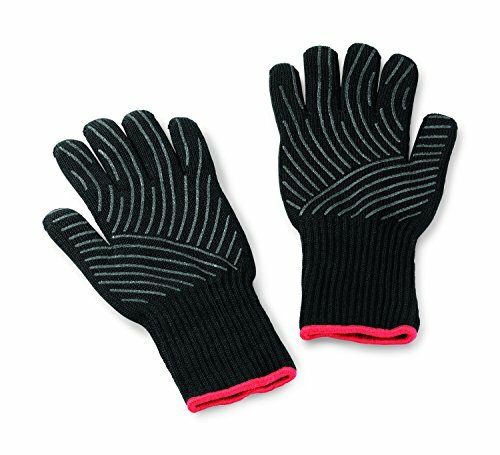 They offer great heat resistance and help protect your hands when you’re doing other household chores too.